Dennis tours the RRS Discovery! 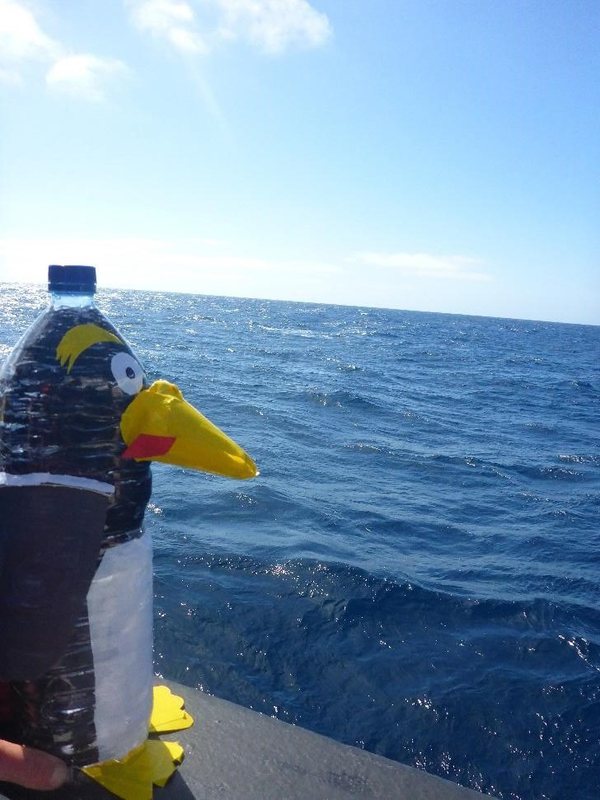 Some of you may remember our trusty companion Dennis the penguin from the first COMICS research trip to South Georgia, Antarctica. 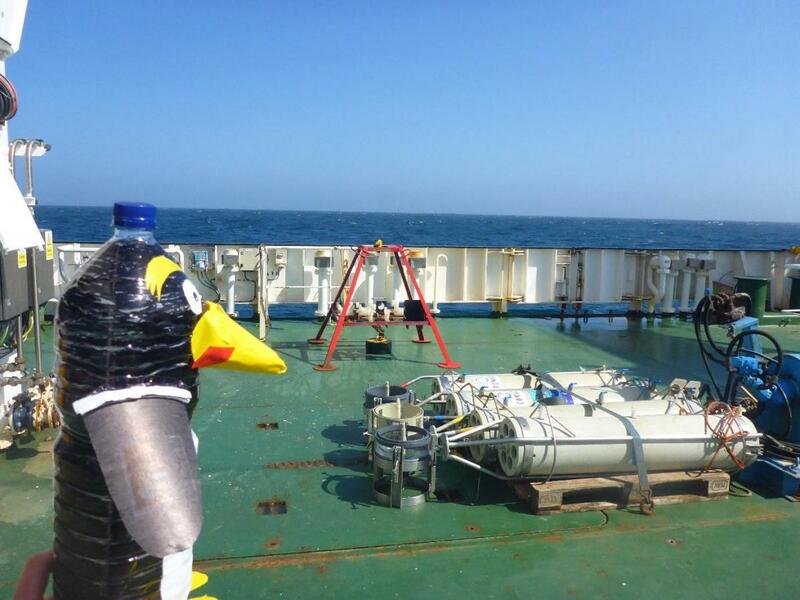 Well, fortunately for us all, he’s back and is loving his time aboard the Discovery for COMICS II off Namibia. After being packed away in a box aboard the ship for many months, Dennis was keen to explore the ship again and check out what was going on this time. As he wandered around the labs he found all sorts of science, and people working around the clock to get samples and run experiments. He found a team measuring respiration, carrying out incubations of water samples with and without particles, and measuring changes in oxygen with microsensors. Dennis had a quick peak but then scurried away as he was afraid he might accidentally knock one of the fragile microsensors with those clumsy feet of his. 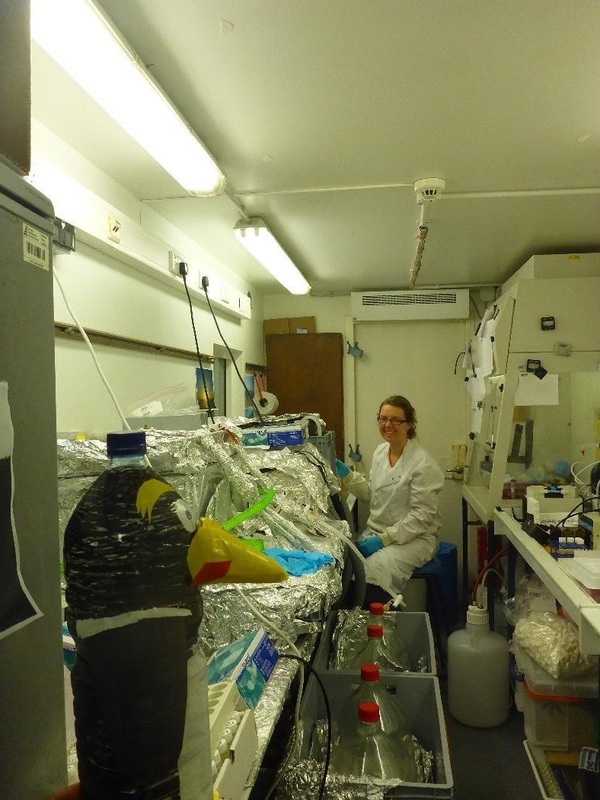 Fortunately Manon’s samples were safe behind the fume hood screen so Dennis watched for a while as Manon did some filtering of seawater samples to be able to detect the DNA of microbes. Hmmm, looked like this job could take a while so Dennis scurried away to see what else he could find going on. Soon Dennis found an interesting looking computer, and was told by the team from British Antarctic Survey (BAS), that this was what they used to control their nets. Using a fibre optic cable, and what Dennis could only describe as ‘jiggery pokery’ they were able to send a message from the computer to their nets, all the way down to 1000 m, to be able to open and close the nets to sample different depth layers. Amazing! Dennis headed out to the back deck to check this net out for himself. 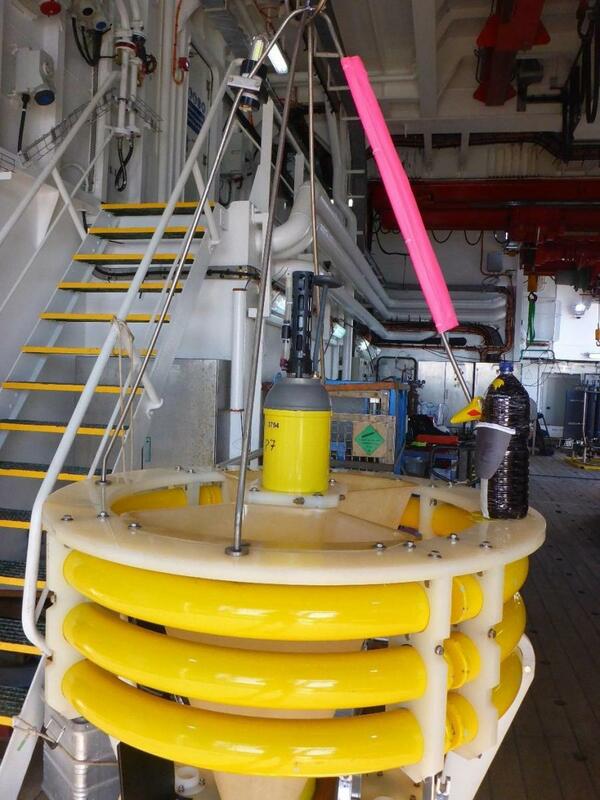 Whilst out on deck, Dennis saw all sorts of cool scientific equipment. There were marine snow catchers, huge water bottles designed to catch sinking particles, and also a large red camera frame, with all sorts of gizmos mounted on it. Dennis learnt that this would get pulled vertically up and down taking photos of the water along the way to try and see how many particles there were and what kind of things were sinking down. Uh oh, better get out the way, looks like there’s another net being deployed, this time a Bongo net (nicknamed Bingo – see the previous blog post by Dan). The team were using this to sample the smaller animals (zooplankton) and do some experiments to measure how fast they feed. Fish!! Dennis waddled in a hurried manner to the cold room, ah ha, fish indeed!! 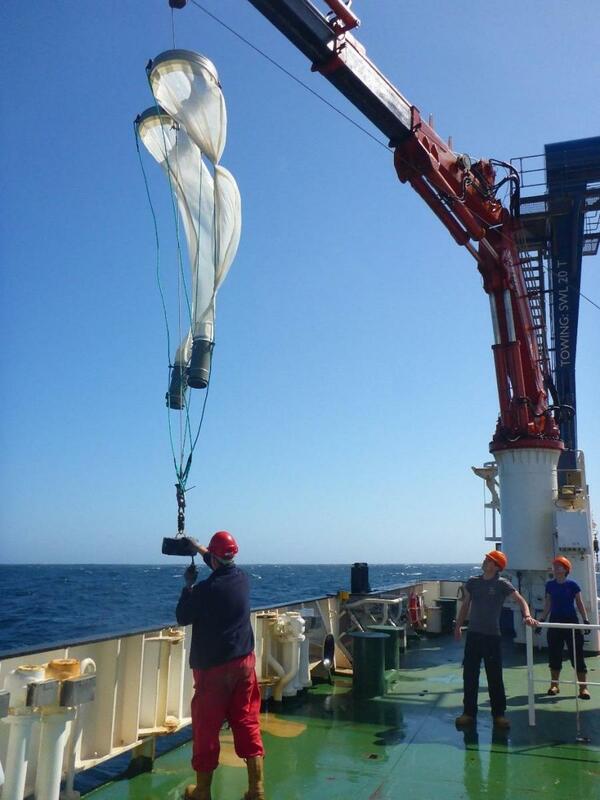 The zooplankton team were sorting their catch from the RMT25 net, a 25m2 net used to sample the large zooplankton and fish. Mmm, everything looked so tasty to Dennis. 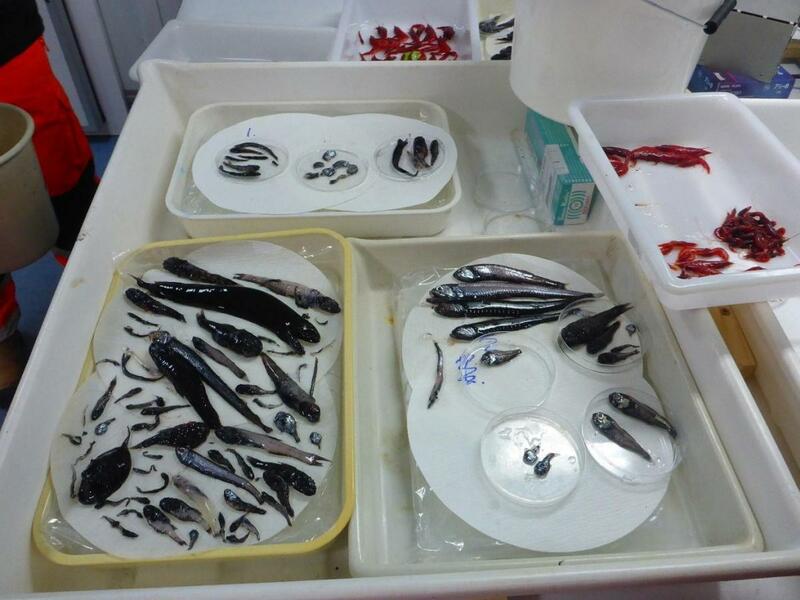 He watched, as they sorted everything into different species and froze them. They would be doing analysis back in the lab to measure their respiration and also measure their composition to try and piece together the food web. Dennis wished he was part of the food web and could have some fish. 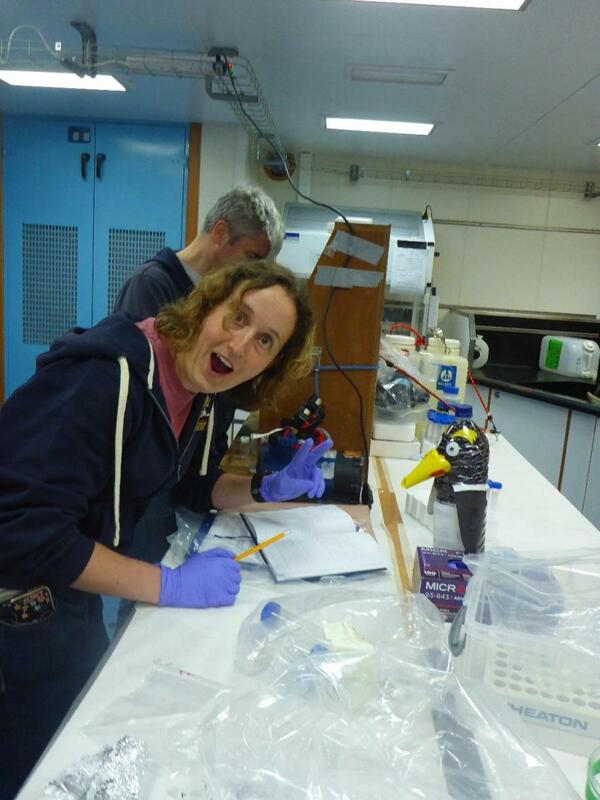 No time for that though, there was some more exciting science to watch, the Pelagras were going in. 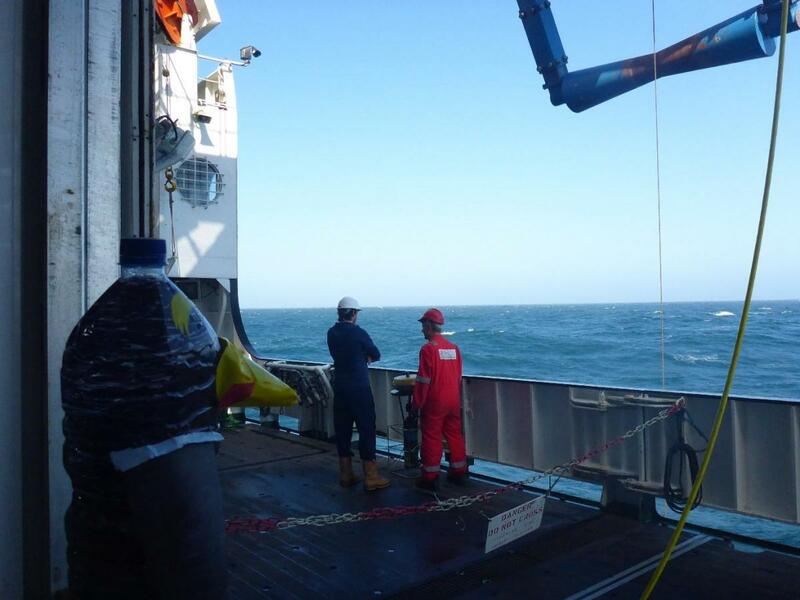 Dennis learnt from Isabell and Kev that the Pelagras are set to sit at a particular depth in the ocean and catch particles for a few days, before popping back up to the surface. Dennis thought this was pretty clever, and watched excitedly as the team deployed 5 Pelagras. They’d be back in three days, hopefully with lots of great samples for the team to work on.